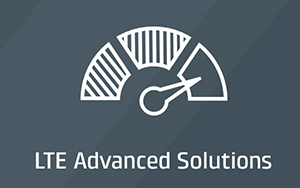 WAN edge infrastructure is changing rapidly as I&O leaders responsible for networking face dynamic business requirements, including changing application architectures. This guide covers a fragmented vendor and technology landscape, with a focus on the increasingly relevant topics of SD-WAN and vCPE. 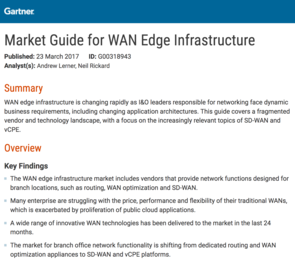 The WAN edge infrastructure market includes vendors that provide network functions designed for branch locations, such as routing, WAN optimization and SD-WAN. Many enterprise are struggling with the price, performance and flexibility of their traditional WANs, which is exacerbated by proliferation of public cloud applications. A wide range of innovative WAN technologies has been delivered to the market in the last 24 months. The market for branch office network functionality is shifting from dedicated routing and WAN optimization appliances to SD-WAN and vCPE platforms. Ample differences exist between vendor products, including architecture, functionality, business models, deployment methods, management, usability, visibility and cost. @ Copyright Cradlepoint, Inc. All Rights reserved.